Before I moved to NYC in 2014, devilled eggs were not in my, shall we say, 'repertoire'. I don't have any memory of eating one and would never have seen one at a family gathering. In NYC it was the opposite- they were everywhere- on restaurant menus, always part of a buffet style dinner at a friends house and nestled between salads and sides. Now that I've moved home, devilled eggs will be one of the things that I will cook for gatherings. What is a devilled egg you may ask? Let me tell you. A devilled egg is a hard boiled egg that has it's yolk removed, mashed with other ingredients and piped back into the cavity of the white. Garnished with some paprika or finely chopped herbs or pickles, it is a one or two bite flavour bomb. There's the classic version- egg yolks mixed with mayo, mustard and vinegar, garnished with some chopped cornichons or a light sprinkling of paprika. In this recipe, I've jazzed them up with some curry spice. There is mango chutney in the mix too, it might not be detectable with the first bite but it makes all the difference. Honestly, I could eat a double digit amount of these in one sitting. They are so delicious. With a drink and some other nibbles, any savoury snack fiend will be in heaven! Who doesn't love a warm chocolate cookie straight from the oven? Nobody- that's who! And if that person exists, I don't want to know them! Actually, on second thoughts, I would like to meet that person. Hear them out. See their side of things. Have a greater understanding. My dad doesn't like warm desserts. So maybe he wouldn't like a warm double chocolate cookie straight from the oven. And we live under the same roof!! I have adopted that attitude towards certain desserts. When out for coffee, I never like a heated scone. And get annoyed when it comes to the table heated from the microwave. So, let me start again. Ahem. 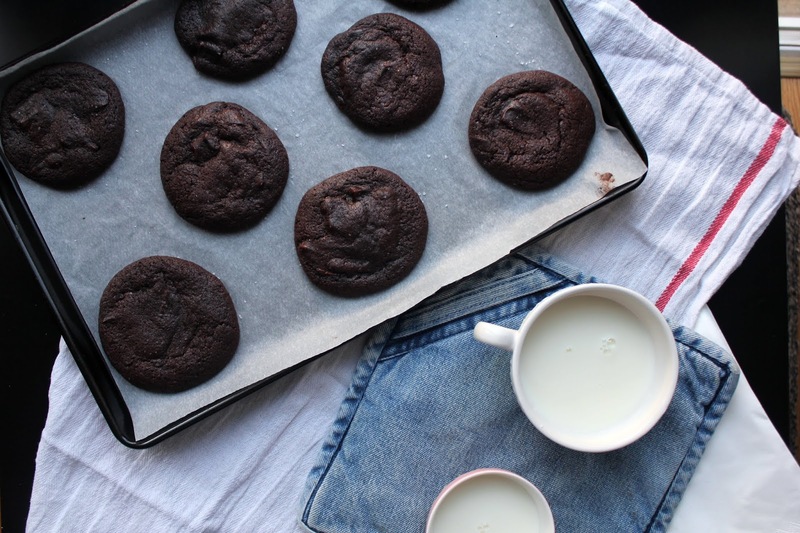 Who doesn't like a warm double chocolate cookie straight from the oven? These cookies look rather plain and unassuming from the outside. A little crinkled around the edge, with a soft uneven surface of chocolate chunks. However, on the inside, it's another story. They are velvety dark with puddles of molten chocolate, squidgy and light. The perfect partner to a cold glass of milk, cow, or otherwise. I was having a conversation with a friend about image. Specifically, personal images created for the online world. How something can look good/bad from the outside but on the inside it's a completely different story. I'm sure, in this day and age, we've all had a conversation amongst friends about unattainable lives we see showcased on Instagram. I do all the time. Have you seen this? Do you follow her? It's tough out there on the internet. And without speaking out of turn, I think it is safe to say that we tend not to post the negative. Instead, posting only the good. Showcasing our best sides, no matter how much pain we're going through. #LivingMyBestLife. I made these sausage rolls for my brother and his friends a couple of weeks ago. They were going to a car show and instead of shelling out big bucks on crappy burgers from greasy food trucks, they asked me to cook for them. Don't get me wrong there is a time and a place for a greasy cheeseburger from a food truck with fried onions. But that can't be all you eat for a weekend! Even if you are a young buck in your 20's, that's a lot of fat! 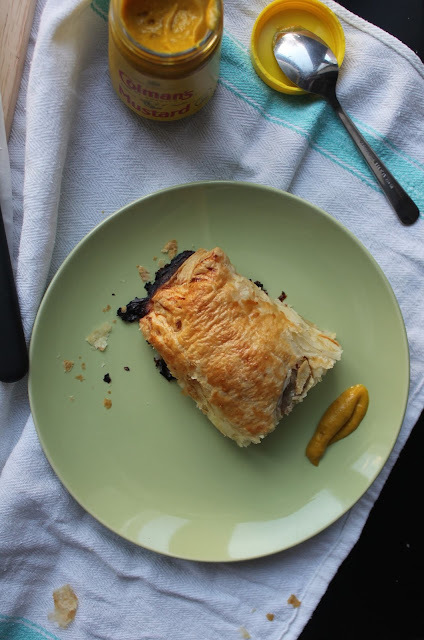 These apple sausage rolls were one of the things I sent with them. A lasagne too, curried chicken salad sandwiches, chocolate cookies and my breakfast bran granola muffins from last weeks post. I want to say they were the best fed boys at the car show?! I only made enough sausage rolls for themselves, so had to snag an end piece from one of the rolls to taste and picture! I don't know who drew the short string on size...it hasn't been said to me, so maybe they didn't notice! A slow weekend morning after a busy week is one of my favourite times. The ritual of making coffee, however you prefer to make yours. I like to take my time over a proper French Press. Hanging around the kitchen listening to music or a podcast, catching up on social media/news, while my coffee brews. The slow-to-get-going decision of what's for breakfast, once you've had your first cup of coffee, of course. Maybe I've already been out and have picked up a fresh loaf of sourdough to go with eggs. Or some pastries to go with good butter and jam. Although, more times than not, I do not leave the house. Instead, leaving the excursion out of doors for good bread and pastries until later in the day, following a walk. Maybe I've decided to do some morning baking. Scones or pancakes are always high on the list. Muffins now top that list. Easy to do, so many varieties and a quick wet into dry ingredient method. After some weighing, a light whisking and a quick stir, you've got a batch of muffins ready for the oven. These muffins have a lot of great qualities. They take no time at all to make, can easily be customised and have granola in and on them. Use whatever granola is your favourite and try experimenting with different dried fruit/nut/granola combinations. They are perfect for coffee and can be dressed up with some butter and jam, once cooled.